I often get inundated with requests on how to deal with illness or injury, It is something that every person will eventually have to face whether an athlete or not. Even the healthy get sick :-). One of the most noticeable things I always see, is that whether injured or ill, especially when it is an athlete they are living in complete denial. They are focusing on the next workout, a day or two away, even if bed ridden and the chances of that are close to zero. This is what I call the stage of complete denial, the person refuses to acknowledge they are ill or injured. “How can it be, I am in the best condition of my life, its not possible”. When there is refusal to accept & acknowledge illness or injury it makes the road to recovery that much longer. The person wont accept and deal with the situation to find a solution to overcome it, instead they wallow in their own misery thinking about lost training sessions, or missed races and it completely demotivates them causing far more setback than wanted. Recently a colleague of mine was extremely ill, I told him he needed at least 7-10 days rest & even then he might not be ready to start training again. He was so impatient that after 5 days he was back on his bike, needless to say this resulted in 6 weeks of reoccurring infections & he is far worse off now. He caused a complete loss of quick & proper recovery due to stubborn inclination. I myself have been through severe illness and in a positive light I think the heavens put me in these situations in order to use my own experiences to be able to help others :-). At the beginning of this year, after an awesome start to the first half of the racing season, I was in top racing condition. A week out from a championship race with eyes set firmly on a podium spot, I fell ill. Thinking it was flu at first I took complete rest. After a week I was still not getting any better, and decided this is not a normal feeling & decided to have some blood tests run. Behold my liver function was elevated which for me is usually a sign of viral infection. Unfortunately I had to miss the race that I had prepared so hard for. However my complete focus had shifted, I had to accept what I was going through and get to the bottom of what was causing this. It took about 8 weeks before a choice of several doctors managed to figure out what was going on. A parasite infection! Never dreamed of that before but this was the case. The immunologists involved wanted to pulse me with a variety of antibiotics every month for 8 months, which to me had zero credibility, and I sought out other opinions. Generally the human immune system is capable of keeping these little bastards under control, however in my case there was no control at all. I was recommended an incredibly good sports doctor who was a thorough diagnostician.The thing I liked about her was that she never knocked ideas or those of the immunologists she actually tended to agree that they were possibly onto something. However she would run additional testing before coming to any conclusions. Examinations were very granular from ultrasounds & blood tests, to ECG’s & lung function testing. Finally the puzzle started to piece together. At age 41 I was diagnosed with chronic asthma, a lung function of only 50%. I was dumbfounded questioning the authenticity of her diagnosis. My reasoning was how can an athlete who trains, races & also gets to podium every now & then suffer from chronic asthma. Her answer to me was quite simple. “You have been training & racing by breathing through a straw your entire life, you never knew any better, you thought this was normal”. It turned out the parasite infection was very real, and the reason my immune system was not dealing with the infection was due to the fact that it was completely run down because of my asthmatic condition. I was always putting in a major effort during training & racing without realizing it at all, and this was the trigger to immunity suppression. 16 weeks in and 2 courses of antibiotics down, with 7 to go, asthma treatment, an incredibly strict eating regime & proper rest, finally I could start some mild exercise. I began slowly and very gradually. Within 3 weeks my running was up to around 20-30km’s a week, and in between only focused on some core and strength training. A far cry from where I was 4 months earlier. A 3rd course of antibiotics, and more improvement, running increased again now to around 50-70km’s a week & started swimming again. What I noticed now was my lungs were not tiring, it was the body first. I guess in a way its amazing that once you can utilize your complete lung capacity you are in a totally different space. Month 6, and swimming & running is now back to where I was, however with a difference, my speeds & times are faster than I was at peak fitness 6 months earlier with less effort. Its got to a stage where I can honestly look back now and say, the rest was completely worth it. It enabled me to focus on the issue at hand and not side track myself with thoughts of misery & denial of not being able to train. I appreciate the fact that the body just shut down and said time out friend, you need to recover. I always tell my clients, you can only come back stronger from illness & injury if you rest & recover properly. For me a huge black hole in my life has finally been filled with an answer as to why I tended to get run down, even though I am so completely focused on nutrition & health. For me its a lifestyle and in my case it was probably even a harder pill to swallow. But acceptance was the key to dealing with it properly. The reason I am using myself as an example is to really emphasize the fact that many people are out there, not feeling 100% yet they often think it was a bad nights sleep, or they ate something terrible or they have a slight cold. But do they really completely understand exactly what is going on. Most of my clientele never really understand what its like to feel on top of the world. Their definition is only the best day they have ever experienced, but whose to say that experience can not be a better one. Below are some thoughts on how you should understand your health status and know how to deal with it when it takes a turn for the worst. Do you understand your health intimately. It is important to have a snapshot of your health, a starting point from where you are working. This means knowing if your blood is 100% normal, or are you lacking any vitamins, minerals etc. Do you know your cholesterol, blood sugar levels, are your heart and lungs functioning correctly. Do you know if your body is in a condition where you can sleep at night and have peace of mind that everything is in good working order. If not then you need to have a medical, and get yourself knowledgeable with your own physiological state in order to ensure your journey is a transparent one. The interesting thing is I have a thorough medical examination every year before the onset of racing season, but I have never ever had a lung function test done. It shows how thorough a medical actually needs to be. I know many people that when ill, injured or fatigued they just don’t listen to their body. This is the first thing you need to accept. You not feeling 100%, you wont be able to give a quality workout, then why do it. Remember training is what breaks us down, recovery is what builds us up and makes us stronger. You wont lose any fitness, trust me I know I was out for many months, a few days to weeks is a weak excuse in comparison :-). As a rule of thumb, I take my Rest Heart Rate when I get up in the mornings, if its slightly elevated and by that I mean around 10%, I will not train. It can mean recovery needed due to fatigue, it can also be a sign as to the onset of illness. There are a majority of people out there that fear doctors. They wait until the last possible moment, when infection or injury is at a pinnacle. This only means one thing, longer recovery time. 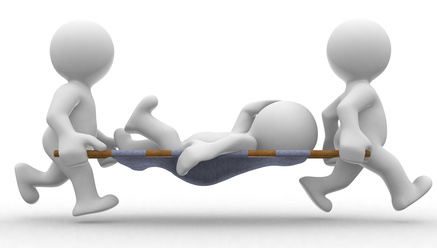 If you are ill or injured don’t wait for it to get worse, pay the relevant medical specialist a visit as soon as possible, before it gets to latter stages when it will be too late and you will truly be setback. The two main fear factors of illness or injury is loss of fitness & weight gain. This is very common among athletes specifically. Well the good news is neither should be a worry. When a person is ill or injured it gives them the opportunity to actually focus on their nutrition, whereas previously they would not. Many just figure if they are putting in so many hours of training, they can eat pretty much what they feel like weight is not an issue. However stop training and you cannot just keep eating what you want. This is where you truly have an opportunity to train your gut instead of your muscles. Its an area that requires discipline, but is even more important than training and is often an area that lacks focus. The truth of the matter is that when a person is ill or injured it should be associated with weight loss not weight gain, however many people eat emotionally due to the stage of denial they are living in and over do it. Monitor your intake, plan your meals, get an expert to help you if you require it. Certain illnesses & injuries can be more quickly eradicated with various nutrient intake. Remember calorie consumption will need to be adjusted as you are now burning less. As for fitness, I mentioned earlier you will come back stronger and that is a fact don’t worry about that at all. When ill or injured, you need to understand everything there is to know about the illness or injury. You know your body better than anyone. You will understand if a treatment is working or not, and how you are feeling at any given time. A doctor is a human being and they do make mistakes especially when it comes to diagnosing correctly. The more information you can give a medical specialist the better it will enable him to make a more informed decision to get to the bottom of what is causing your ailment. Do the research speak to people, use the internet. This can be very difficult especially when you have missed your big race or you know that you will not be prepared for something down the line because illness or injury is too close to the event. I completely understand how a one feels under these circumstances. However in life our goals are forever changing and shifting. We also don’t just have one goal we have many, and on route to our bigger goals are smaller ones. Once you understand the extent of the illness or injury and the time period you are going to be out of action for, you should set aside time to plan your future goals. This can be exciting and help motivate you even more especially since it gives you something else to look forward to. Make sure the goal is realistic and achievable you don’t want to set yourself up for disappointment. Finally I just want to stress that we are all human, life often throws curve balls at us which are unexpected. How we deal with them will ultimately determine the outcome. Failing to deal with them will leave you with an unknown which is not a space that you want to be in. Everything we experience in life on a physical level does happen for a reason, its up to us to listen to those messages our body is giving us and not ignore them. Get rid of that stubbornness for a short period of time, it will be well worth it in the long run.